In July 2015, the Vanuatu Fisheries Department (VFD) and the Aquaculture Section of the Secretariat of the Pacific Community (SPC) jointly convened a meeting of leading tilapia farmers in the southern part of Espiritu Santo. This was held to exchange ideas and plan ways to increase production of tilapia to meet the increasing need for fresh fish in Luganville and the inland parts of Santo. The work is being supported by ACIAR’s (Australian Centre for International Agricultural Research) Community Aquaculture project, in which SPC, VFD, as well as WorldFish Solomon Islands are project partners. A strategy being applied by the Community Aquaculture project is that of facilitating farm clusters, with each having lead farmers whose farms are maintained at standards that serve as examples for others to see and gain knowledge. One purpose of the meeting in Santo was to identify lead farmers, and then reach an agreement about what constitutes a ‘lead farm’ for tilapia fish. Collaborative work will then focus on bringing selected farms up to the agreed standards, and find ways to disseminate methods and knowledge from those demonstration farms to other places in Santo. The expansion of tilapia aquaculture in the Pacific has seen a trend where many farmers rush to build farms and copy things they have seen or heard without waiting to seek out expert advice. The result has been construction of farms that are all of different shapes and sizes and, in some cases, difficult to operate. Similar experiences have been noted in the Solomon Islands; therefore, Daykin Harohau of WorldFish Solomon Islands was invited to attend the meeting to share his experience of facilitating tilapia farm clusters in Malaita. In return, he gained a close look at farming of Nile tilapia Oreochromis niloticus, which is present in Vanuatu but not in the Solomon Islands where the tilapia species being farmed is the smaller and slower growing, but more invasive and salt- tolerant, Mozambique tilapia Oreochromis mossambicus. 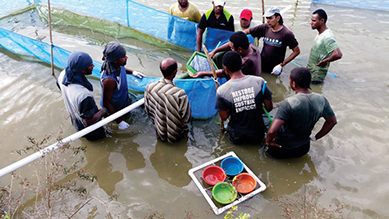 Most subsistence tilapia farmers throughout Fiji depend on the Naduruloulou Freshwater Research Station (NRS) hatchery for their fingerling and broodstock supply. The NRS usually produces its fingerlings by utilising open pond or knock-down tank methods. These methods involve housing breeder fish in ponds or tanks and allowing them to breed naturally. Young hatched (swim-up) fry are collected using scoop nets. The Asian Institute of Technology (AIT) has developed an incubator method, which is now used globally to produce billions of tilapia fingerlings. This method involves holding breeder fish in net cages called hapas in ponds and regularly collecting tilapia eggs. The advantage of this method is that a larger number of eggs can be collected and cultured in incubators, in clean water that is under optimum conditions rather than collecting fewer swim-up fry. Larger numbers of breeder fish can also be held in hapas, which enables better usage of space. Two years ago, the Secretariat of the Pacific Community (SPC) sponsored a representative from NRS to attend hands-on training on this method of seed production at AIT in Thailand. This was the first exposure of this method to the NRS hatchery and it generated interest among fisheries management, who were eager to trial the method and train a group of hatchery staff in order to operate it. In August 2015, in response to a request from the Fiji Ministry of Fisheries and Forests, SPC mobilized to assist with the trialling and transfer of this technology to Fiji. The experiment had two main goals: to evaluate the technique as an option for tilapia seed supply at the national hatchery and to build staff capacity. The number of people farming cottonii seaweed (Kappaphycus alvarezii) in the Autonomous Region of Bou­gainville, Papua New Guinea and its small offshore islands increased remarkably from 800 in 2014 to 4,552 in 2015 after training for coastal communities sparked great interest in seaweed farming. Eleven new nurseries and seaweed planting sites have since been established around Bougainville to support the large number of farmers entering this new industry. These 4,552 farmers are now planting seaweed that they will send to Bougainville Seaweed Ltd (BSL), who exports the dried seaweed to China. 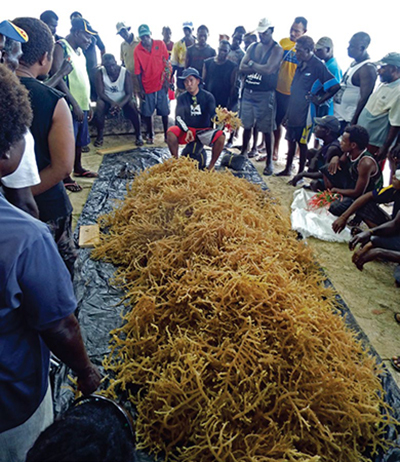 In addition to buy­ing the seaweed produced by the farmers, BSL supports them with seed stock nurseries that are now established in the Nissan, Selau, Atoll, Tinputz and Buka Districts of Bougainville. This significant increase in the number of farmers is attributable to post-training scale-up and expansion efforts being coordinated by BSL, district officers of Bougainville, the Papua New Guinea National Fisheries Authority, and the Secretariat of the Pacific Community (SPC). The National Fisheries Authority has also provided a great deal of ropes and other equipment to BSL and the farmers. To support livelihoods of communities and assist in the replenishment of sea cucumber stocks in the region, the Secretariat of the Pacific Community (SPC), with funding assistance from the Australian Centre for Interna­ tional Agriculture Research (ACIAR)/ DFAT Australia, has conducted two workshops on sea cucumber (sandfish) breeding and live microalgae culture techniques. The participants were fisheries officers and people working in the private sector in Pacific Island countries that have a sea cucumber restocking and farming programme. The first workshop was conducted in Kiribati with the Ministry of Fisheries and Marine Resources Development in January 2015 as part of an ACIAR project on community-based aquaculture, which, for Kiribati, focuses on the culture of sandfish (Holothuria scabra). 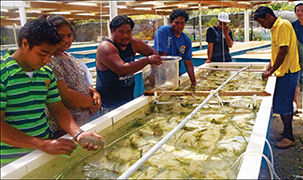 A total of 14 staff from the Tanaea hatchery, including fisheries assistant trainees, were trained in all aspects of hatchery techniques for breeding sea cucumber and microalgae culture. The second workshop, conducted from 27 April to 23 May 2015 in Fiji at the government’s fisheries station in Galoa, was attended by 12 participants from Fiji, Vanuatu, Solomon Islands and Cook Islands. Since the official opening of the Samoa Fisheries Marine Multispecies Hatchery at Toloa in early 2014, the Aquaculture Section of the Fisheries Division, under the Ministry of Agriculture and Fisheries, has been very busy working on giant clam spawning and larvae rearing activities. 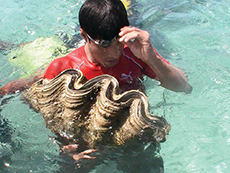 In order to meet the Fisheries Division’s annual targets and work plan related to giant clam spat production and distribution to coastal communities, the Aquaculture Section has carried out two successful spawning events after a first unsuccessful trial. At the same time, the aquaculture team staff have built their capacities and skills in hatchery operations and giant clam rearing during two training sessions run by Cletus Oengpepa, an international expert on giant clam farming and a long-time World Fish Center fellow, and Ruth Garcia Gomez, SPC Mariculture Officer. These spawning and training activities were also an opportunity for staff who were already involved in spawning activities in the past to share experiences and skills with newly recruited staff. Is aquaponics viable in the Pacific Islands?